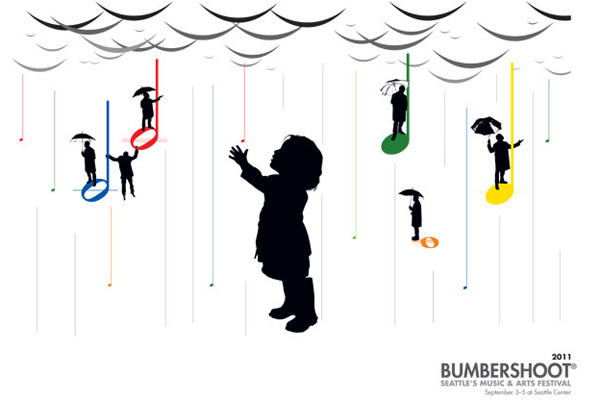 I was selected to create the 2011 Bumbershoot Fine Arts poster. “Sustenance” is a combination of photos and music notation, where the raindrops are musical notes and the clouds are phrase markings used in musical notation. A representation of a three-movement composition, it consists of contrasting parts titled nourishment, endurance and strength. The accompanying musical composition will be available as a free download beginning a week prior to the festival. 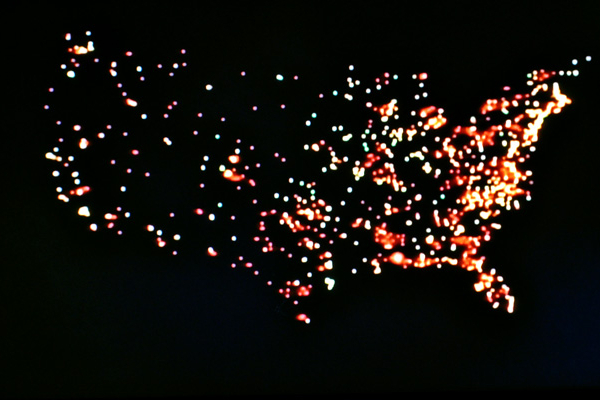 During a “Prison Issues” residency at Blue Mountain Center I created Proliferation, an animated mapping of the US prison system. You can view the complete video here. 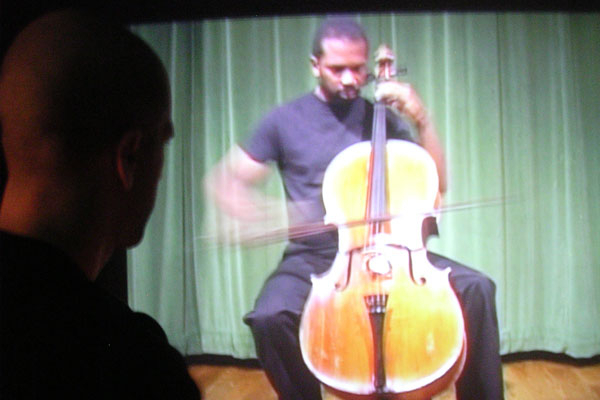 “Eleven Conversations” allows the viewer to manipulate a videotaped cello performance by waving a hand over an infrared beam. The image responds to the proximity and speed of the hand. 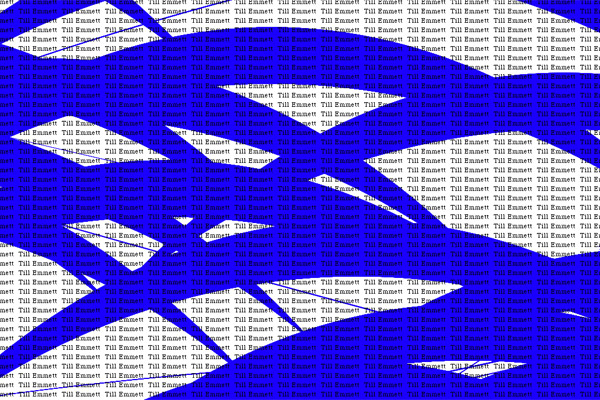 Sounds Like… is a sound installation without sound. The four pairings of large images and video are based on the classic elements: Earth, Air, Fire, and Water. Each pairing also represents a significant event in US history relating to Americans of African descent, and their experiences. From broken promises associated with 40 acres and a mule, to the horrors of lynching, and the murder of Emmett Till, as well as honoring the spirit of those who fought for their rights. 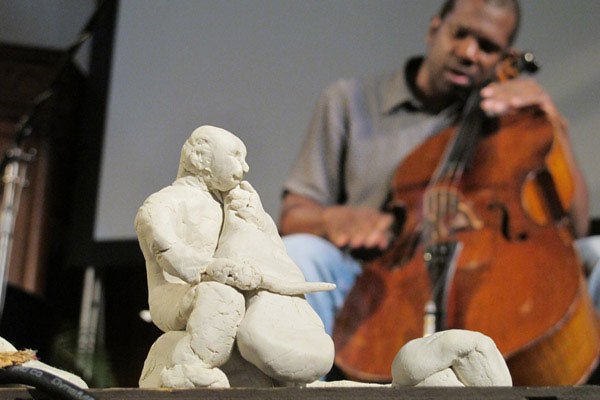 Cello concert of improvised compositions inspired by original clay sculptures created by the audience. Every object has a sound. I enjoy performing in galleries and creating live, improvised sonic interpretations of artwork, whether it’s paintings from the Renaissance Period, or modern sculptures. 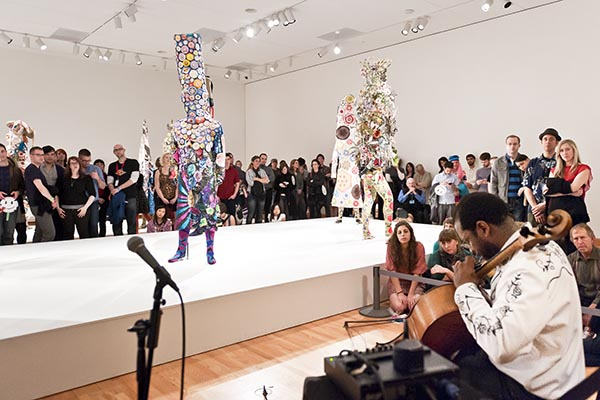 I have performed live sonic interpretations of works such as Nick Cave’s sound suit exhibit, Meet Me at the Center of the Earth, sculpture by Alexander Calder, and various paintings throughout the Baroque Room of the Seattle Art Museum. 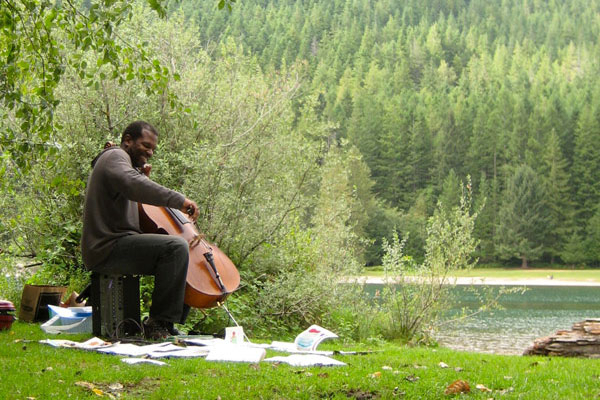 Water from Rattlesnake Lake was used along with leaves, twigs, grass, and branches to paint pieces that I interpreted on cello. Participants were provided with paper and non-staining watercolor paint. Thirty-two-channel audio installation entitled Trails of Vapor by Paul Rucker. 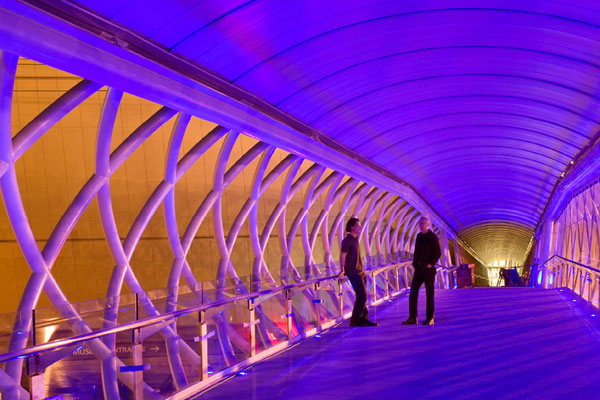 The pedestrian bridge provides visitors with an audio experience of flight through an original “sound artwork” by award-winning, multidisciplinary Seattle artist Paul Rucker. Ruckers sound art for the Museums bridge includes new musical compositions interwoven with audio sampling from aerospace history and nature. Rucker performs on cello as well. A play on Abraham Lincoln’s Gettysburg address, and four graphic musical scores. 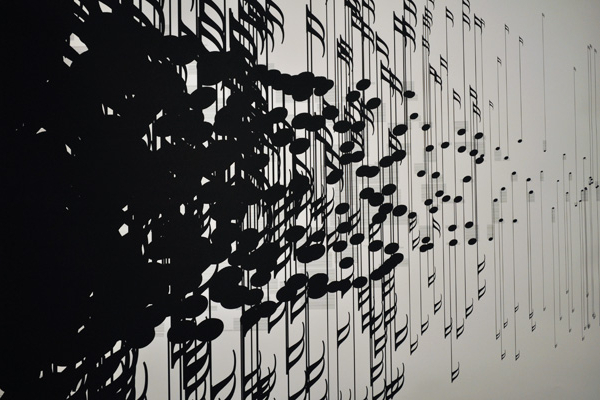 The viewer is given an MP3 player and listens to corresponding compositions and arrangements. Each score measures 40 inches x 60 inches. 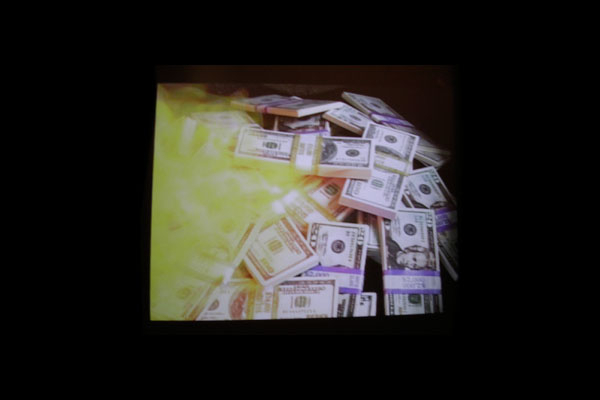 “Catalyst,” which was recently shown at the Jack Straw New Media Gallery in Seattle, WA employs a touch screen using xy technology (x being the horizontal coordinate and y being the vertical coordinate on the touch pad): where you touch the screen determines which aspects of the video/audio are altered. The open Studio Project/ Gallery 301 will be closing at the end of this month. For about 15 months I had use of an amazing space in the heart of historic Pioneer Square. I’m grateful to Storefronts Seattle for this opportunity. The first show was presented by Rulon Brown. His installation received great reviews and lead to many other opportunities including a show at Seattle Art Museum’s REMIX. Thanks to Rulon Brown, Laura Castellanos, and Juan Alonso for sharing their talents. It was great to see large works by Laura and Juan on the walls of the gallery. A special thanks goes to Juan Alonso who was instrumental in keeping the space lively while I traveled to and from Baltimore. Thanks again to these wonderful artist, and amazing people. Our loss is your gain. Juan is having a sale. He needs to downsize for his new space. Feel free to stop by the space, or give him a call to set up an appointment. Thank you to those who supported my Souper Fundraiser. Your generosity is deeply appreciated. It was an amazing night with wonderful energy. Thank you to Max Billet for the yummy soup. Tuesday I’ll present a public lecture for the summer MFA program from 6-8 at the Lazarus Center Auditorium at the Grad Student Center at MICA. I just got back from Liverpool and London….. I went to Liverpool to learn about American history….